Amazing hospitality, amazing views, place was unbelievably clean we felt very safe. Breakfast was amazing as well! AMAZING! Where to find Praiano hotels near an airport? How can I find hotels in different Praiano neighborhoods? Where can I find hotels in Praiano that are near tourist attractions? If you are choosing where to base yourself in or around Praiano, there is an extensive range of possibilities. If you are after a great place to stay within a 0.1-kilometre (0.06-mile) radius of the center of Praiano, Expedia's up-to-the-minute database features at least 216 places to base yourself that meet that criteria. Experienced travelers who appreciate the convenience of booking a hotel right in the heart of town should check out the latest deals at the Casa Angelina Lifestyle Hotel and Il Frantoio, which are within a 1-kilometre (0.6-mile) radius of Praiano's center. The Praiano area has a solid selection of budget accommodation options that will satisfy thrifty travelers. The Hotel Margherita is 0.6 kilometres (0.4 miles) from the main part of Praiano, while the Hotel Torre Saracena is 1 kilometre (1 mile) away. Alternative budget room options include the Alfonso a Mare and the Hotel Il Pino. 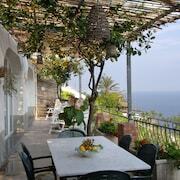 The Le Sirenuse is 4 kilometres (2 miles) from the middle of Praiano. 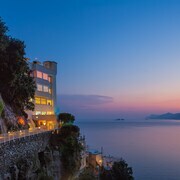 Alternatively, the Monastero Santa Rosa Hotel & Spa can be found 5 kilometres (3 miles) away. Alternatively you could book the Santa Caterina or the Bellevue Syrene. Looking for more things to do? Consider spending a day or two visiting Church of Santa Maria Assunta and Palazzo Murat, which you'll find in Positano, 4 kilometres (2 miles) to the northwest of Praiano. 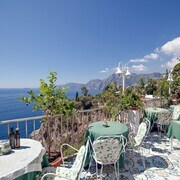 The Hotel Le Agavi and Villa Fiorentino are a few of the Expedia-recommended accommodation options in Positano. 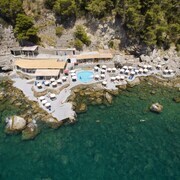 Alternatively, you could consider staying at Furore, 2 kilometres (1 mile) to the east of Praiano, where you can pick from the Grand Hotel Tritone and Hotel Belvedere. While in Furore, make sure you visit the Church of San Giacomo and Church of San Michele. Why not spend a few hours rubbing shoulders with Amalfi Coast sports obsessives at a local game. Stadio San Paolo is 35 kilometres (23 miles) to the northwest of Praiano. Sleep close to the action at the Grand Hotel Parkers or the Hotel Micalo. Naples International Airport is situated 35 kilometres (22 miles) away from Praiano. Should you wish to stay close by, can easily book a room at the Romeo Hotel or La Ciliegina Lifestyle Hotel. 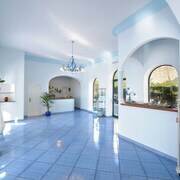 What are the most popular Praiano hotels? Are there hotels in other cities near Praiano? 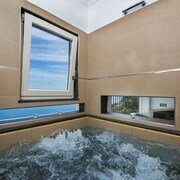 What other types of accommodations are available in Praiano? Explore Praiano with Expedia.ca’s Travel Guides to find the best flights, cars, holiday packages and more!